With one magic word, not only does young Billy Batson transform into the superhero Captain Marvel, but Republic Pictures created the finest comic book-based movie serial of all time. Republic, never an “A” studio but one that had more resources than the others on Poverty Row, spent a long time trying to acquire the rights to make a Superman movie serial. But by then DC had sold those rights to Fleischer Studios, which was hard at work on a series of lushly animated shorts starring the Man of Steel. Republic then turned their attention to Superman’s #1 rival for comics readers’ sticky dimes, Fawcett Comics’ Captain Marvel. Produced by five writers and directed by the team of William Witney and John English, 1941’s The Adventures of Captain Marvel — which will become available on Blu-ray on 9/19 — opens in Thailand, at an archeological expedition at the volcanic Valley of the Tombs. Inside a sealed crypt, a mysterious, powerfully destructive device called the Golden Scorpion is discovered. When the Golden Scorpion’s series of quartz lenses are aligned, it emits a powerful beam, which seals the tomb. 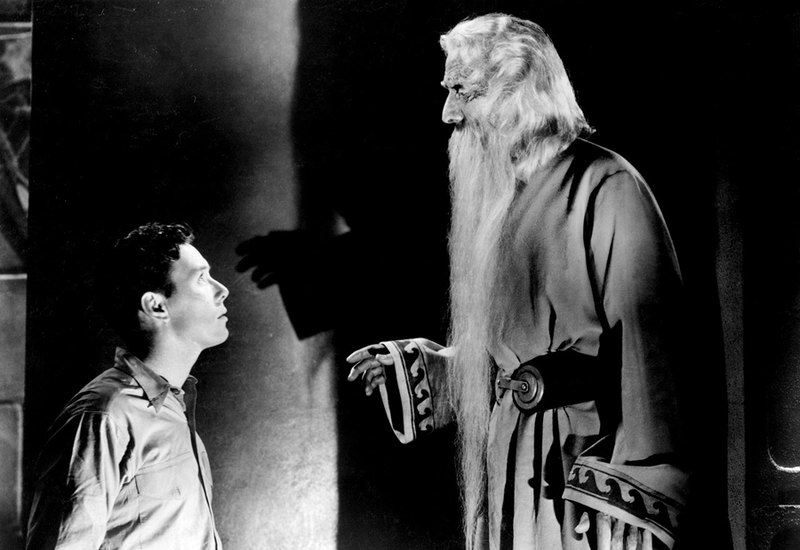 A member of the expedition, young radio broadcaster Billy Batson (Frank Coghlan Jr.), heeded the crypt’s seal not to enter, so he is chosen by an ancient magical wizard named Shazam (Nigel De Brulier) to be the recipient of amazing powers. All Billy has to do is utter the wizard’s name, and he is transformed into…Captain Marvel! The expedition’s team of scientists decides that the Golden Scorpion is too powerful to risk falling into the wrong hands, so the various lenses that power it are divided among them upon returning to the States. But a mysterious, hooded figure simply known as the Scorpion steals the device, and starts knocking off the various scientists in order to possess the lenses. 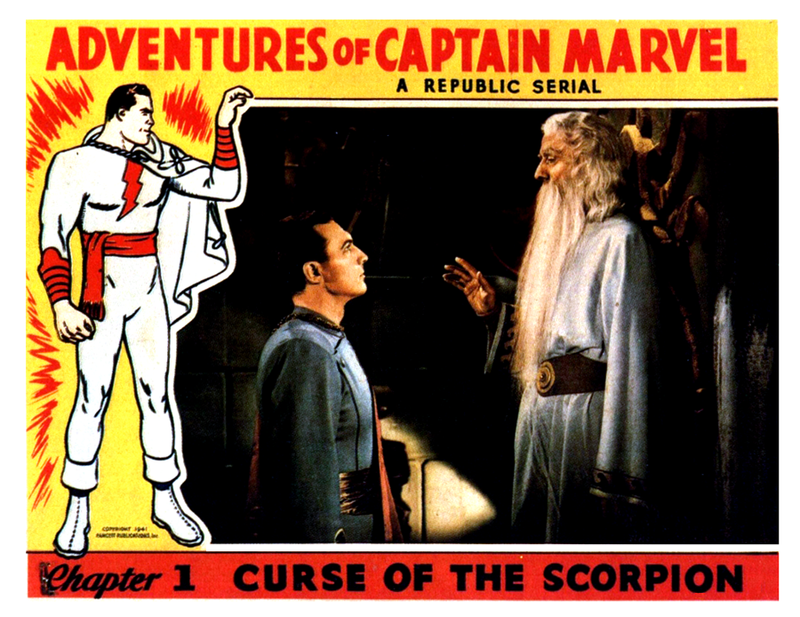 Hot on his heels and threatening to ruin his plans is Captain Marvel (Tom Tyler), who uses his super abilities (the genius of Solomon, the strength of Hercules, the speed of Mercury, etc.) to stop the Scorpion’s henchmen. Billy figures out that the Scorpion is most likely one of the scientists, since he seems to know what the scientists plan to do before they do it. On a trip back to Thailand, the Scorpion spies Billy transforming into Captain Marvel, and threatens to kill Billy’s friend Betty Wallace (Louise Currie) unless he confesses the nature of his dual identity. 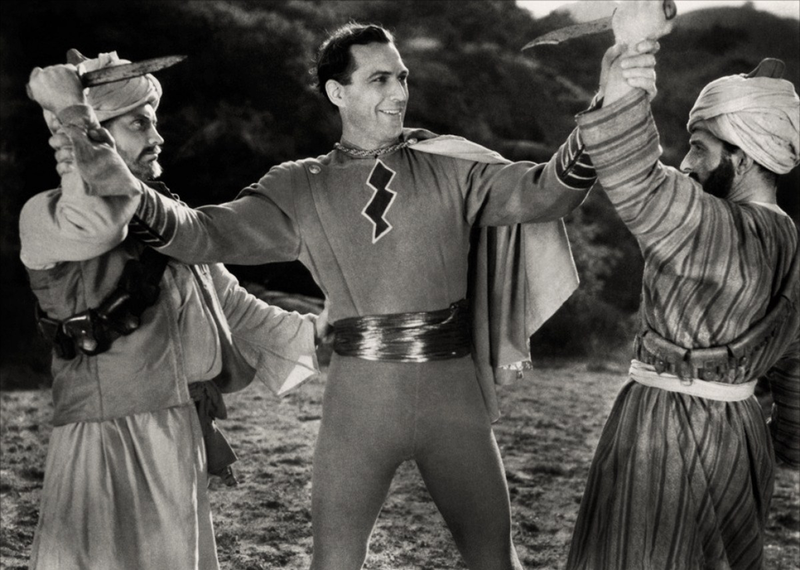 Billy’s only response is “Shazam!” — and he unmasks the Scorpion. The hooded crook is later vaporized by the very device he sought to control. Now that Captain Marvel is no longer needed, he transforms back into Billy, who marches off with Betty, victorious. Despite their limited resources, Republic used skill and imagination to bring Captain Marvel to cinematic life. The special effects team of Howard and Theodore Lydecker constructed a 7-foot-tall dummy dressed in a highly accurate version of the good Captain’s red, yellow and white uniform. Using a series of small wires, which were invisible to the camera, the filmmakers were able to simulate Marvel in flight, having him soar across the screen, as well as toward and away from the camera. Once matched to shots of Tom Tyler (who, as a star of countless westerns, was adept at action), the effect is quite convincing, a million times better than the live action-to-animation switch Columbia Pictures tried to pull off with their Superman serials in the later part of the decade. In addition to the well-executed flying sequences, Republic seemed aware that what most kids wanted to see was Captain Marvel doing cool stuff. After some too-brief appearances in the first few chapters, we see Marvel almost get chopped in half by a guillotine, smash throw a window covered by metal bars, and routinely pick up the Scorpion’s goons and toss them around like dolls (which, of course, they were). There’s a sequence with Captain Marvel trapped in a mine about to be flooded that features some nifty rear projection work. Republic’s special effects team got a workout on The Adventures of Captain Marvel, but they were up to the task. Tom Tyler’s voice is a little too reedy to completely work as Captain Marvel, but he has that certain joie de vivre that matches most people’s conception of the World’s Mightiest Mortal. And this Captain Marvel is a bit (OK, a lot) more violent than the more genial comic-book version—at one point he grabs a nearby machine gun and mows down a bunch of bad guys, with nary an afterthought. He also threatens to throw one of the Scorpion’s goons onto a bed of nails, which, unsurprisingly, produces the necessary information. The perennially young-looking Frank Coghlan Jr. gets most of the screen time as Billy, but he belts out his magic word at every opportunity. 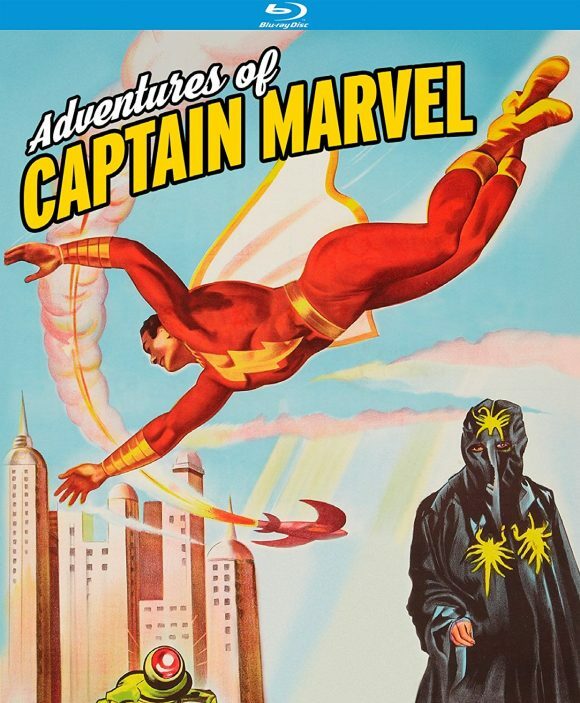 Movie serials were never meant to be watched in one sitting, so if you revisit The Adventures of Captain Marvel (or any serial, really) as one long movie it does get a bit repetitive—Billy gets kidnapped and conveniently gagged about half a dozen times, and watching one scientist after another get bumped off does get a bit dull. None of them are particularly compelling characters, so when the Scorpion is unmasked, it’s a big who cares? 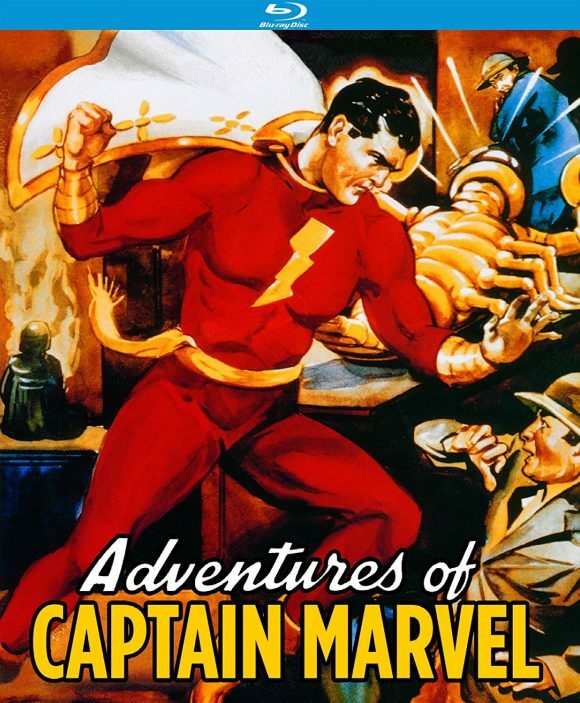 Still, The Adventures of Captain Marvel moves at a brisk pace, the effects are highly convincing (especially when you consider this was produced more than 75 years ago, and Republic had no previous live-action superhero movie to model its effects on), and we get to see Marvel do lots of cool stuff. It is a bit curious that the producers chose to tie Marvel’s origin so tightly to the tomb of the Golden Scorpion—once that case is solved, Billy’s alter ego is essentially retired. But, of course, if Captain Marvel had been needed again (to take on a malevolent worm, perhaps? ), I’m sure Republic would have found a way to bring him back. Despite numerous and more sophisticated live-action superhero adventures that have come since, The Adventures of Captain Marvel has never really gone away. 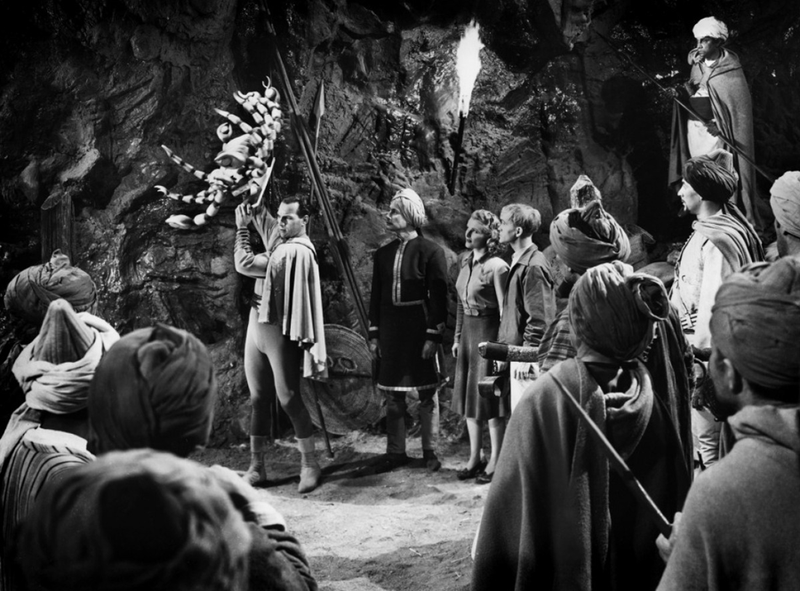 It was re-released to theaters in the 1950s in its serialized form, then as an extra-long, Peter Jackson-esque movie in the ’60s during the Batman TV show craze. It was released on VHS and DVD and, as mentioned, hits Blu-ray on 9/19, thanks to the fine folks at Kino Lorber, who have compiled some nifty special features to accompany all the superheroic derring-do. Like Captain Marvel himself, the serial is ageless. — The Star-Crossed ’70s World of CAPTAIN MARVEL. Click here. Rob Kelly is a writer/artist/comics and film historian. He is the co-host of Aquaman and Firestorm: The Fire and Water Podcast, the host of The Film and Water Podcast, and the host of TreasuryCast. He refuses to call Captain Marvel by any name other than Captain Marvel. Still one of my favorite serial Next to the Superman ones. I saw this serial recently on dvd. I must admit I wanted to see more interaction with Marvel and Billies friends. I was expecting the relationship that Superman had with Lois and Jimmy in the 50s adventures of Superman. But the heroine was knocked out many of the times that she was rescued by Captain Marvel. Also when it was revealed that Billie was in fact Captain Marvel, there was no shot of his friends reaction.